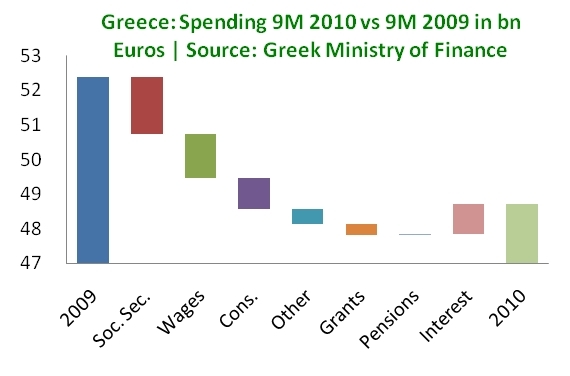 The Ministry of Finance has released its September Budget Execution Bulletin (in Greek, here). The story is familiar: expenditures continue to perform much better than revenues and the budget deficit is showing considerable improvement, albeit still below targets. Revenues have risen by 3.6% relative to 2009. This number must be set against a progressively less ambitious target: back in January, the government forecast a 10.8% increase in revenues and this target changed three times to 11.7% in February, then 13.7% in June and now to 8.7% in September. I have written before about the details of that revenue shortfall, but it is worth repeating here that much of the gap can be explained by (a) the inability to absorb EU funds and (b) lower spending which leads to lower than expected consumption taxes. Spending, by contrast, continues to shrink at impressive rates, having fallen 7% relative to 2009. However, for only the second time this year, the achievement is below target since the government now expects a 7.8% reduction in expenditures versus the 5.5% reduction it was forecasting in August. In other words, spending restraint is still strong, just shy of the increasingly aggressive targets set by the government. Looking at a little more detail on spending, it is clear that two areas are providing the bulk of the reduction: social security and wages. Together, these have shrunk by €3 bn, against an overall drop of €3.6 bn. Interest payments, by contrast, continue to be a drag, and the interest burden increased by 8% ( €859 million). Overall, then, the budget deficit is expected has shrunk by 30.90%, which is still below the target of 36.9%, which in turn is a revised target from the 39.5% forecast in August 2010. This is also the first time that the government has revised downward its deficit target - all previous revisions showed an expectation that the deficit reduction would be higher than anticipated. No more. 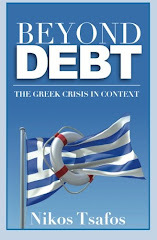 Foreign Investors in Greece, the New Barbarians? How Are Greek Households Coping?